Donald Trump’s sudden announcement in December that the US troops would withdraw from Syria took the world by surprise, and serious concerns were expressed in the Respected US. Secretary of Defence Jim Mattis resigned immediately. That was questioned and ridiculed as fighting continued against ISIS. And a complete US withdrawal would have left Syria, Iran, Turkey and Russia in positions of influence. The plan has now been adjusted, with 200 peacekeepers to remain. The United States will leave “a small peacekeeping group” of 200 American troops in Syria for a period of time after a U.S. pullout, the White House said on Thursday, as President Donald Trump pulled back from a complete withdrawal. It would also have left the Kurds, who the US had supported in Syria, in a precarious position with Turkey. And it would have strengthened Iranian and Russian influence. US senator Lindsey Graham had been strongly against the announced withdrawal. Sen. Lindsey Graham (R-SC) delivered a fiery speech on the Senate floor Wednesday night blasting President Trump’s decision to withdraw U.S. troops from Syria. Graham called Trump’s declaration that ISIS has been defeated “fake news” and leaving the country would be a “stain” on America. Republican Sen. Lindsey Graham, a top ally of President Donald Trump, expressed concerns on Wednesday that Trump’s comments about withdrawing troops from Syria have emboldened terrorist groups like ISIS, and that he hopes Trump thinks “long and hard” about his next moves when it comes to withdrawing troops from the war torn country. “That’s the dumbest f******g idea I’ve ever heard,” Sen. Lindsey Graham (R-S.C.) reportedly replied when Shanahan confirmed the Trump administration still plans to complete the Syria withdrawal by April 30. Graham’s spokesman Kevin Bishop did not dispute media reports of Graham’s comments during the meeting, adding the senator declined to comment for this story. The pressure on Trump to think long and hard – something that seems alien to his personality – seems to have worked. “This will ensure ISIS does not return and Iran does not fill the vacuum that would have been left if we completely withdrew. This also ensures Turkey and SDF elements that helped us defeat ISIS will not go into conflict. “A safe zone in Syria made up of international forces is the best way to achieve our national security objectives of continuing to contain Iran, ensuring the enduring defeat of ISIS, protecting our Turkish allies, and securing the Turkish border with Syria”. “With this decision, President Trump has decided to follow sound military advice. This decision will ensure that we will not repeat the mistakes of Iraq, in Syria. For a small fraction of the forces we have had in Syria, we can accomplish our national security objectives. It still won’t be easy keeping all the different forces at bay and counter the influence of Iran, Turkey and Russia, but at least the US will have a base presence to work from. There is a heck of a lot of sorting out still to do in Syria. The Syrian government and Syrian Armed Forces and its international allies, a loose alliance of majorly Sunni opposition rebel groups (including the Free Syrian Army), the majority-Kurdish Syrian Democratic Forces (SDF), Salafi jihadistgroups (including al-Nusra Front), and the Islamic State of Iraq and the Levant (ISIL), with a number of countries in the region and beyond being either directly involved or providing support to one or another faction (Iran, Russia, Turkey, the United States, as well as others). Iran, Russia, and Hezbollah support the Syrian Arab Republic and the Syrian Armed Forces militarily, with Russia conducting military operations since September 2015. The U.S.-led international coalition, established in 2014 with the declared purpose of countering ISIL, has conducted airstrikes primarily against ISIL as well as some against government and pro-government targets. Since 2015, the US has also supported the Democratic Federation of Northern Syria and its armed wing, the SDF. Turkey, on the other hand, has become deeply involved against the Syrian government since 2016, actively supporting the Syrian opposition and occupying large swaths of northwestern Syria. Between 2011 and 2017, fighting from the Syrian Civil War spilled over into Lebanon as opponents and supporters of the Syrian Arab Republic travelled to Lebanon to fight and attack each other on Lebanese soil. Furthermore, while officially neutral, Israel has conducted airstrikes against Hezbollah and Iranian forces, whose presence in southwestern Syria it views as a threat. The 200 US troops that will remain in Syria have a few challenges – but will no doubt have a mass of ships and planes and troops not far away in support if needed. And one of the biggest ongoing battles may be in limiting the damage Trump does with spur of the moment announcements on Twitter that can have serious implications for the Middle East and the world. I hope Trump has not been given the ability to order nuclear strikes by tweet. There continues to be defenders of Donald Trump and deniers of any Russian collusion. On Friday, the New York Times reported the FBI opened a counterintelligence investigation into Trump the day after he fired FBI Director James Comey in the spring of 2017. The counterintelligence inquiry was later wrapped into the FBI’s broader Russia collusion investigation, which special counsel Robert Mueller was appointed to lead after Comey’s ouster. Rep. Devin Nunes, the top Republican on the House Intelligence Committee, said the New York Times’ bombshell report on a counterintelligence investigation into President Trump’s ties to Russia only strengthens the argument that the FBI has no evidence of collusion against the Trump team. In a follow-up, the Washington Post reported the president took steps to try to protect his conversations with Russian President Vladimir Putin, including pressuring a translator to withhold information on discussions between the two leaders from administration officials. And there continues to be claims that there was obvious cause for concern. Shortly after inauguration, your new commander-in-chief spouts false information about Polish aggression toward Belarus. This is not supported by the Intelligence community you are in, and the only source for this viewpoint is Russian propaganda. After firing of National Security Advisor that lies to agencies investigators, the President corners your boss 1-1 asks him to go easy on National Security Advisor who lies about his conversation with Russians. During this period, the President inexplicably and repeatedly asks your boss if he’s under investigation with regards to Russia, despite your boss and other intel heads going out of their way to brief the President about Kremlin efforts to potentially compromise & manipulate him. While Congressional committees investigate Russian interference, the President fires your boss for his handling of an email investigation into the President’s opponent, an investigation that helped elevate the President rather than hurt him. You later find out a draft memo from President to your boss regarding his firing cited the Russia investigation. The President then goes on national television and in an interview says he fired your boss because of the Russia investigation. A week after firing your boss, the President invites Russian leaders into the Oval Office, Russian photographers capture the moment, but US media is not allowed to observe. President then brags to Russian leaders about firing your boss. Sometime during the spring, if you’re not already aware, you read a news story alleging the President’s son-in-law may have sought a way to communicate with Russia via a back channel not monitored by you and your colleagues. During summer, you watch the President attend NATO summit and shove Montenegro PM, in an Interview claim Montenegro is aggressive, might start a war. This mirrors Russian propaganda & you know Russia backed covert operation destabilize Montenegrin election. For next year, either you, your colleagues and your organization, FBI, are discredited by President. He mixes true and false information in public disclosures which you are not allowed to respond to. If you do respond, your accused of leaking and could be fired or even jailed. Documents & information from confidential sources you’ve pledged to protect, are selectively leaked into public through those who are supposed to provide government oversight. These inappropriate disclosures make your job as an investigator nearly impossible & hurts your sources. At some point during the summer or before, you learn that the President’s son was receiving & responding to direct messages from website that was releasing emails stolen from the President’s opponent by Russia. 1st two years President’s term, you watch him take a negative, adversarial stance toward NATO and particularly Germany. This strains your relationship with your most valuable intel partners, your Counterterrorism agent colleagues depend on them & they help fight war on terror. Over next 2 years, President aggressively seeks meetings with Putin who helped elect him. Need for meetings is not clear. One President meets in private with Putin for 2 hours without witnesses but translator. To this day, you, your bosses don’t really know what was discussed. President emerges from private meeting with Putin and on world stage in Helsinki accepts and validates Russian denials about election interference & rejects years of your teams intel work. This badly damages your reputation and partner trust with your organization. Separately, your President publicly discusses a Russian proposed partnership on cyber security, this insane concept is mind boggling to you as an investigator as you’ve just spent years tracking these same Russians who just attacked your country. Throughout your investigation into Russian interference, you watch as your President’s attacks on the Special Counsel, Justice Department & FBI are amplified and spread in America by the very Russian troll social media accounts and state sponsored propaganda you are investigating. Throughout the Special Counsel indictments, hearings and trials, you watch the President and his legal team publicly interject, discredit witnesses and discuss pardons, all subverting the rule of law and justice which you’ve dedicated your life to protect and defend. You either know or learn a parallel investigation shows Russians representing a bogus Russian gun rights movement penetrated the political party hosting members who’ve tried to discredit you – you recognize this as a TEXTBOOK espionage/influence op you learned at FBI academy. After two years, the Attorney General over you, who appropriately recused himself from Russia investigation, is fired for seemingly no clear reason after taking public lashings from the President. Your AG is replaced by an acting AG whose unqualified for position, has limited experience justify such high level appointment, you’ve watched him on TV discrediting your agency and your team’s investigation despite seeing none of evidence or knowing anything Russian influence. You read public reporting that the best apartment in the Moscow Tower project pursued by the President’s business was offered to Russia’s President Putin, the same Putin your President always sides with over you and your agency, the Putin who helped your President win. You either knew or learned through a redaction error that the President’s campaign manager was alleged to have lied about providing polling data to a Russian whom he owed money, via a former Russian GRU contact. That was Trump’s campaign manager Paul Manafort. Wrote thread through day from memory without web searches, I’m sure I missed a lot, & this is all on the public, can’t imagine what it must feel like to serve FBI during this investigation,we clearly don’t know everything Mueller team knows, I imagine there is much more to learn. If Mueller has been doing his job and is as thorough as has been claimed I imagine he has learned quite a lot. As Watts shows, there is already a lot out in public, but no doubt there will be more to come when Mueller’s report comes out. It has been reported a draft of his report has already been done. Whatever the outcome of Mueller’s investigation, it is important for the US and for the world that the results are publicly known. Donald Trump recently announced that the United States would be withdrawing their troops from Syria. This raised questions about the fate of the Kurds who had been supported and used by the US, but are opposed by Turkey. What if the Kurds attack Turkish forces? Should Turkey not respond for fear of economic devastation? What if Russia…? What if Iran…? What would economic devastation mean for Turkey and the Middle East and the Mediterranean? So it sounds like Trump’s Secretary of State doesn’t know what the hell Trump is playing at. This isn’t an unusual situation for Trump’s administration. Defense Secretary Jim Mattis resigned over Trump’s Syrian withdrawal announcement. Trump has already impacted significantly on the Turkish economy. Things are getting crazier, with Trump letting loose on Twitter making seemingly impulsive, destablilising (for his Administration and for the world) and potentially devastating pronouncements. Reuters Explainer: Where do the Kurds fit into Syria’s war? The Russians will be quietly looking for any advantage they can take over the Us withdrawal from Syria. The Syrian Government would probably not react well to an bid for full independence. So the US has been supporting an organisation they have designated terrorists? Now Trump has threatened Turkey not to do that. It’s complicated. And difficult to see a lasting solution. I don’t think Trump can deal with complexities, apart from making them more complex with his ad hoc impulsiveness and threats. Some good may accidentally emerge from his approach, but there is a far greater likelihood he will make things worse. Russia will be seeing how they can benefit from all of this. I can’t see Trump deliberately aiding Russia here, but that is a highly likely inadvertent outcome. Drones have been promoted as a means of making deliveries. I remain very sceptical about whether this is a good thing or not. Even if it can be developed into a reliable means of transport how much drone traffic do we want zinging all over town? In 2013, Amazon unveiled plans for a new delivery service called Prime Air, which would use drones to deliver packages. Amazon made its first drone delivery in the U.K. in December 2016. The company plans to expand the service to dozens of customers near its British facility in the near future. 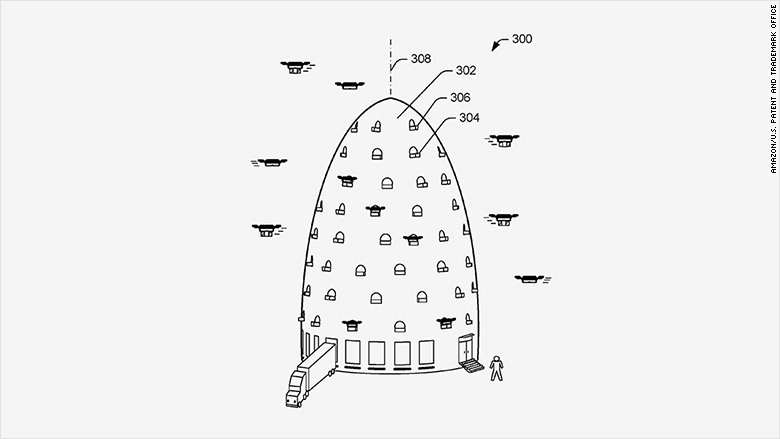 Amazon has filed for a patent for beehive-like towers that would serve as multi-level fulfillment centers for its delivery drones to take off and land. The facilities would be built vertically to blend in with high rises in urban areas. Amazon envisions each city would have one. Each city would have an Amazon drone tower? And how many others. A Dominos drone tower? History has been made today in Whangaparaoa just north of Auckland. As of this morning, drone deliveries of pizza are now reality as the first commercial deliveryof food by drone to a customer was successful. The first ever flying order delivered at 11:19am today was put together by Domino’s Pizza and Flirtey. I don’t know how this project is progressing. Or the Amazon drone delivery project. What about delivering the mail? Remember mail that came to our letterboxes? This was just one embarrassing failure. What about the potential dangers? Will we have to start wearing helmets in public in case an errant drone drops on us? Or a book or a pizza? I live on a flight path for seagulls – they are frequently passing overhead heading up or down Otago Harbour. Seagulls can be a pest in some parts of town, but they are a majestic part of bird life here, I love watching them soar past. It would be funny if they learnt to attack pizza drones to score a free feed. But the silent soaring of birds is different to the buzz of drones doing suburban deliveries. We may have something that will make drones unviable here – the Resource Management Act. If anyone tries to get them off the ground in any serious way.